Well after last weeks beautiful weather, I didn’t expect this rain. The timing isn’t good as I have jobs stacking up and it undoubtedly hampers things, a lot. When the rain began to fall, Monica and the other Highland cows mood improved miraculously, they just don’t get on with the warm weather. With their thick coats on, I suppose it’s like me and my brothers wearing our snorkel parkas, in the summer of ’76, all zipped up with the hood up, it wouldn’t be nice for long. Like always though, we just work around the weather out there. Last week I mentioned about our lambs roaming a little and that was lovely to see them running around the place, but that was until I caught them eating all of our young fruit trees. The problem is that the ground is uneven in many places and the lambs find the gaps to get through. Each day I have had to block up yet another gap under the bottom rail, so as to stop their marauding adventures along my line of fruit trees. I will be so happy when they are too big to fit through any gaps! It’s been extra rations all week, just to help that along. Well, Thursday evening arrived and I got a call to say that our Llamas were only minutes away. I soon guided the truck, up the green mile to their new home. I had been chasing all day, trying to get the new shelter completed. I had done my homework and I wanted to be able to move it around their paddock if required and thankfully, I had completed it around 5.00pm. 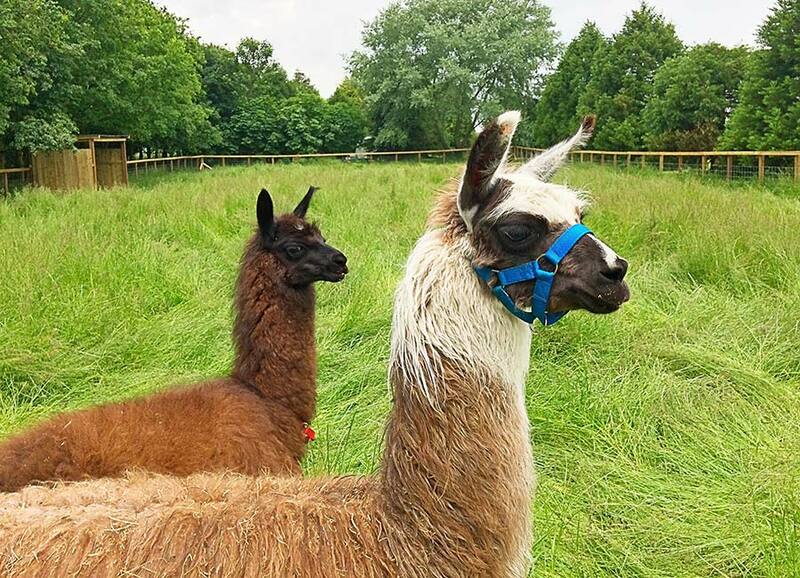 Before letting the Llamas loose in their paddock, I felt it wise to get a head collar on both of them, so I could start to halter train them from day one. I do want them trained up and handled regularly. So, the head collar went on the first one easily, that was fine and then the second and that went well too, things were going surprisingly well. With the help of the breeder, I then took the first one through the gate into the new home, while he brought the second one from the truck. Now, it’s funny, but Wendy had mentioned any number of times over the days leading up to their arrival, that she couldn’t wait to see the llamas chasing me around the field. Well unfortunately for Wendy, that didn’t happen, but what did happen was that as I walked my llama further into the field, for some reason it got a little jumpy and leapt several times through the long grass, with little old me hanging on for dear life. Now, in hindsight, I could have or should have let go, but I didn’t and as I got up off the ground to dust myself off, I looked across to see Wendy in stitches, doubled up with laughter. I’m glad she found it amusing, but I am just so pleased she didn’t have her phone with her to video the experience! It was almost dark on Sunday night, walking back through the yard, I saw something run across the new flagstones, I ran over and watched in horror as a mole headed down a hole and under the new patio. Not on your nelly, I thought. I quickly lifted the corner slab and was able to catch it before it got away. If he and his family had got settled under there and under the new turf we’ve recently laid, it would have been a nightmare. Phew!